Thread: Launch #7 ~ HABBOX RARE VALUES ARE BACK!!!!!! Launch #7 ~ HABBOX RARE VALUES ARE BACK!!!!!! Yes! You read that correctly! For our seventh (and sadly final) public launch of Content Week, I am THRILLED to finally announce that Rare Values are back on Habbox!! Since I became AGM and V7 launched, we unfortunately lost the Rare Values system and over the years, we've consistently been asked what's going to happen. We went through various plans, various managers, various AGMs and GMs, various ideas, various coders... until we finally settled on the system you can now see! Some changes needed to be made to make this system useful for the current Habbo market - that means looking at what people are trading outside of the Marketplace, what's more important to have on an independent fansite with an extremely strong history of values, and the lovely @DJ_Shadow; really helped us to narrow it down. You can see from the banner that this system is the official partner of Ultra Rare Trade, and we intend to keep working closely with the forum (who have been official partners with Habbox for years!) 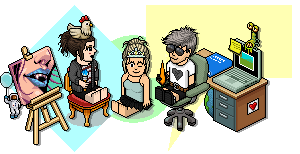 to develop it further, contribute to it, and provide competitions and events for members there as well as on Habbox. From a personal viewpoint, it is actually a bit surreal to be writing this thread. To actually have something live and working and being able to release it to the public is absolutely crazy, and honestly not something I thought would happen. I would like to say a massive thank you to @Joe; and @scottish; who helped build and customise the system, to my colleagues at work who helped me fix some things without knowing what it's for, to Harry and @Sho; for their work in uploading and finally to all of the Rare Values Managers we've had over the years who have contributed to the final system you see before you. As always, any bugs please post here, any comments or opinions please post below! If your opinion is "RV is redundant this is pointless" then I will reply once now: the way we've developed this, in partnership with some of the most well-known and prolific traders on the hotel, is intended to supplement and bolster the Habbo trading system as we know it.